Four years ago, I had a bilateral adrenalectomy. When talking to other Cushing's patients who are contemplating surgery, I often tell them I would choose this 100 times over, I wouldn't ever make a different decision, but that's easy for me to say because I didn't have another option. I was probably 300lbs, or close to it. The last weight I recorded was 285 at my last endocrine appointment, I knew I did not want to see 300, so I did not weigh myself for the weeks before my surgery. I was close to having a stroke, or heart attack, and either would be hard to recover from in my fragile state. My blood pressure was always very high, the morning of my surgery it was 160/100. The radiation oncologist who I had a consult with mentioned that he didn't think I would live long enough to wait for radiation therapy to work (3-5 years). I failed the test to get into some last minute medication trials to buy more time. I literally had no choice but to have this surgery. So, it was an easy choice. In the year after my BLA, as I saw more friends and family, people would comment on how my legs were already less swollen, and my "trick" of having pitting edema was already gone. Although my swelling diminished, my weight did not. I stayed at about 250 pounds for most of that year after losing much fluid. The thought crossed my mind that I was not cured. I must still be producing cortisol, because it seemed like every other treatment had failed me. So, I stopped taking steroids. We all know this story. Today, I weigh 150 pounds, less than I did in high school. I finally have a solidly normal BMI. My face is still rounder, and I still have that Cushing's double chin. I have far too much extra skin on my abdomen, back, arms, and legs. Really, it's everywhere. Someday, I would like to fix that but I cannot trust that I will not go through this all again. I am quite sure that I still have adrenal tissue producing cortisol. I have not needed Florinef, a mineral corticoid, for most of the summer, a time of year that most people need it most. I have had a longer journey with Cushing's Disease than most, but I am a better, stronger, more empathetic person because of it. I learned who will always be there for me, despite the mood swings, crying, crying, crying, and the way I looked. I have had the chance to teach people about Cushing's, by meeting new physicians while in the hospital, and talking to medical students and PA students. Of course, I thought having a bilateral adrenalectomy would quickly solve all health issues and I would go on to live a healthy, normal life, but that has been anything but the truth. Medication trouble, vocal cord dysfunction, hemolytic jaundice, Lupus, parathyroid tumor, and possibly MEN-1, I still have lots to think about and watch for, and my life is still dominated by my lack of health. Bless you Danielle. 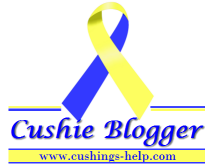 I am still awaiting a cure from Cushing's after two pituitary surgeries and one adrenal out. Your blogging about your experiences has helped so many of us to hang in there. I wish better health for you. You are in my prayers. Hello Dainelle, I had Cushing's and had a bilateral adrenalectomy two years ago. I understand the pain and confusion you are going through. Trust me, I felt the same way many many times. After surgery I too thought things will go back to normal right away...but I come to found out that especially these thing takes time. I was reading your blog and thought to myself that you are a super strong person. Congrats on your recovery.